There are few things in life as wondrous as coffee. We know it best as the drink that makes our workdays possible, but whether in liquid, bean, ground, or extract form, the magical substance also works overtime to help a girl out in the beauty department. For example, did you know that caffeine is scientifically proven to blast away cellulite? Or that applying some java to your hair can boost growth? Or that it’s a pretty darn effective way to kiss puffy eyes goodbye? We and many experts agree: While knocking back several cups of coffee can amount to too much of a good thing, the beauty and wellness benefits of our beloved elixir nevertheless abound. Keep reading to discover seven reasons why coffee, in all forms, should be part of your beauty and skincare regimen! We typically associate antioxidants with power foods like blueberries and pomegranate, but a cup of joe packs a powerful antioxidant punch that’s amazing for overall skin health. Antioxidants fight premature aging of the skin due to heat, light, pollution, and damaging free radicals. Coffee’s antioxidant power, flavonoids, are released when brewed, so for this particular beauty benefit, drink up! The protective antioxidant benefits of coffee also extend to your hair—masks or hair products containing java will prevent breakage and enhance shine. Not to mention, leave your mane smelling amazing. Try OGX’s Niacin & Caffeine Shampoo ($6) to give your growth a boost. When applied topically via eye creams, the caffeine in coffee helps reduce under-eye puffiness by restricting blood flow to the area and reducing swelling. Not only are coffee grounds ideal for making a natural and inexpensive homemade body scrub (check out our cellulite-busting version! ), but they’re also effective without being harsh. Many of nature’s exfoliating properties (think sugar or sand) will slough and smooth skin but aren’t exactly gentle. Softer coffee grounds naturally exfoliate dead skin and will leave it silky smooth sans irritation. 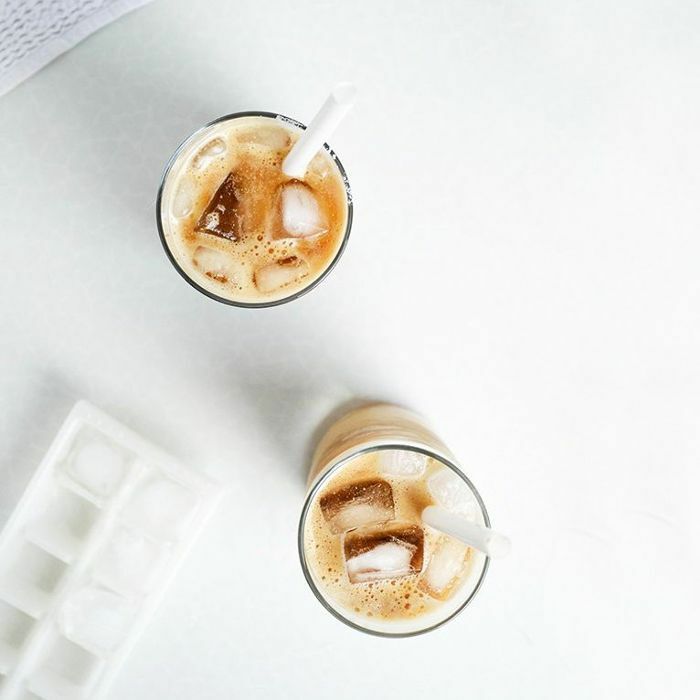 Because coffee is a diuretic, creams and serums containing coffee can temporarily minimize the visibility of cellulite by drawing fluid away from fat cells, essentially dehydrating the fat cells. This shrinks their size, resulting in a tightening effect from the outside. Heck, yes! You know how coffee wakes you up in the morning? It does the same thing for your skin. When applied as a face mask, the stimulating properties of coffee improve blood flow and making your skin appear radiant, bright, and, well, alive. This post was originally published on June 9, 2014. Bonus tip: See how supermodel Adriana Lima uses coffee to fight cravings.